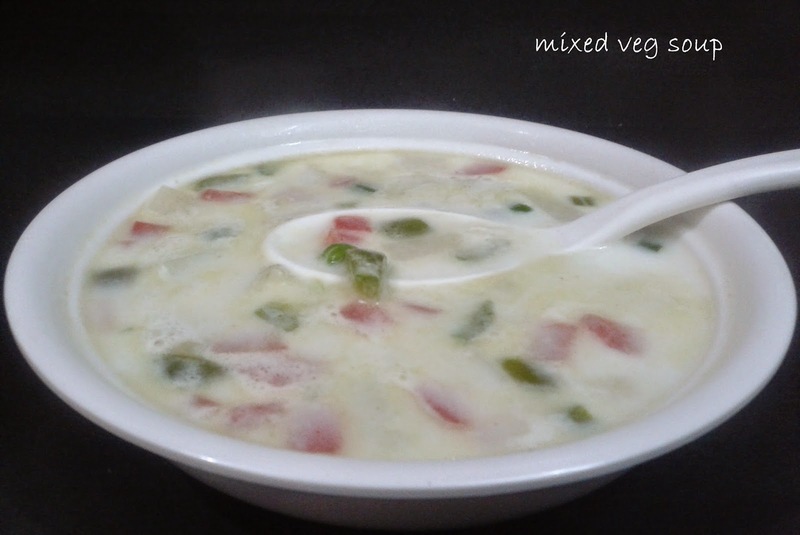 Take cottage cheese, corn kernels,onion, green chili ,salt, pepper, sabzi masala and 1 tbsp corn flour in a bowl and mix well. Mix rest of the cornflour (or you can take maida/all purpose flour) with 1-2 tbsp water,add a pinch of salt and make a slurry. Now make rolls out of the mixture of desired shape and dip them in the slurry first and then roll them in the bread crumbs. 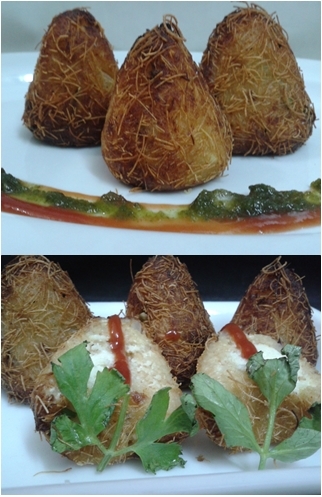 Heat oil in a pan and deep fry the rolls till golden brown in color. Add warm water as required and knead into a firm dough. Keep the dough on rest under damp cloth for 10-15 minutes. Divide the dough into 6 or 8 balls according to the size required. Take 1 cup water in a bowl and a clean polythene bag. Spread the polythene bag on a rolling board(chakla) and sprinkle few drops of water on it. Take one ball at a time and spread it evenly on the polythene bag with the help of damp fingers and try to make a round poori. 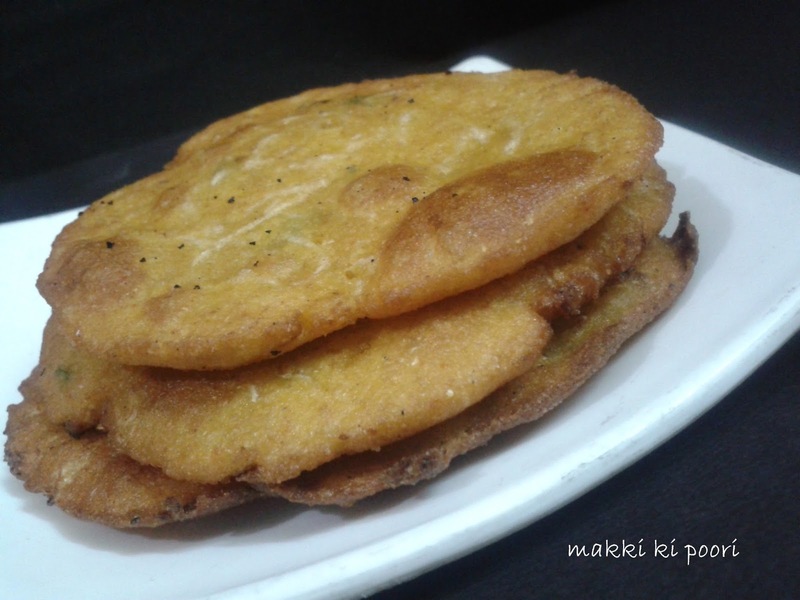 Pick up the polythene bag along with poori with one hand and transfer the poori on the other hand peeling off the polythene and immediately put it in hot oil. Cook from both sides turning sides after regular gaps till it is done from both sides. 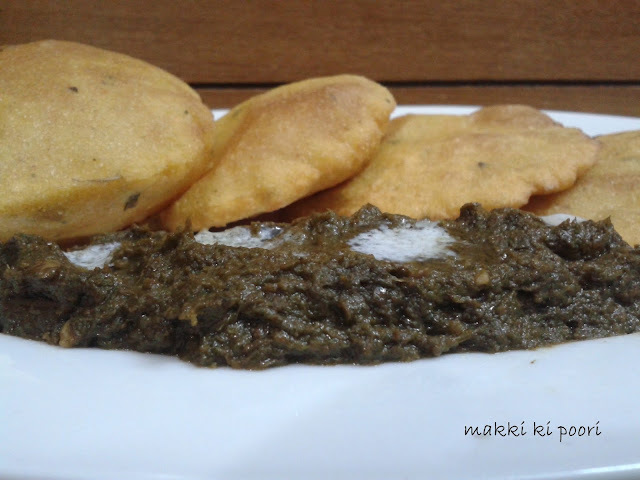 Top the makki ki poori with butter and serve hot with sarson ka saag,ghee shakker or gur. 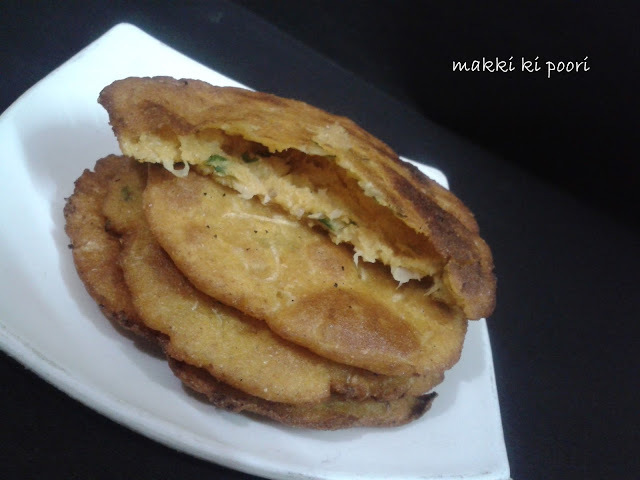 It is better to make makki ki poori than makki ki roti because it will take lesser time to cook, will be softer than makki ki roti, completely cooked from inside and if you are serving it in a party you can make them pre-hand and heat the pooris on a griddle or tava at the time of serving. Re-heating will also extract (if there is any) excessive oil from it. 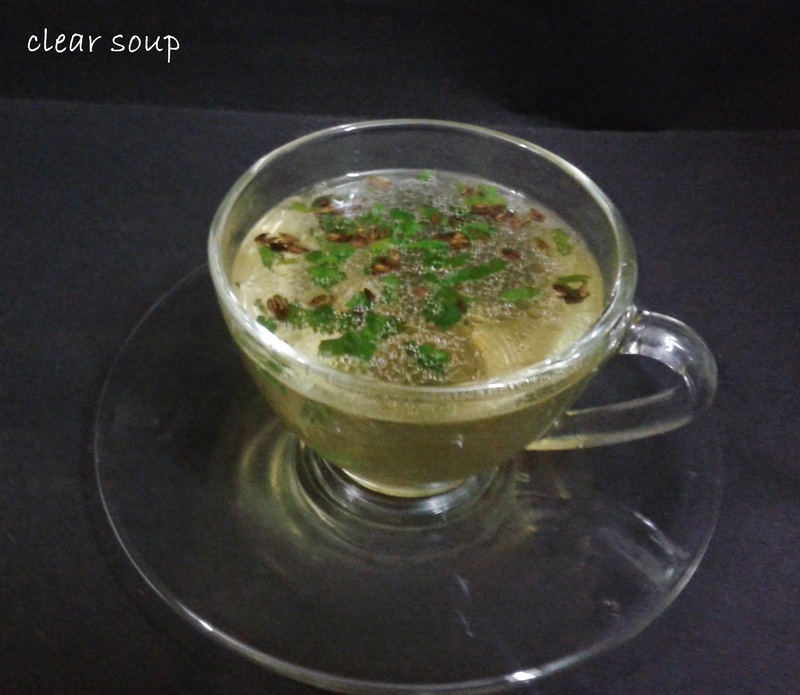 If fresh 1/2 cup fenugreek leaves are not available then you can replace it with 2 tbsp dry kasoori methi. Grease a baking dish with some butter or oil and dust with flour.Keep aside. Add three fourth of the tuti frutti to it and mix well. In another bowl mix rest of the ingredients i.e. 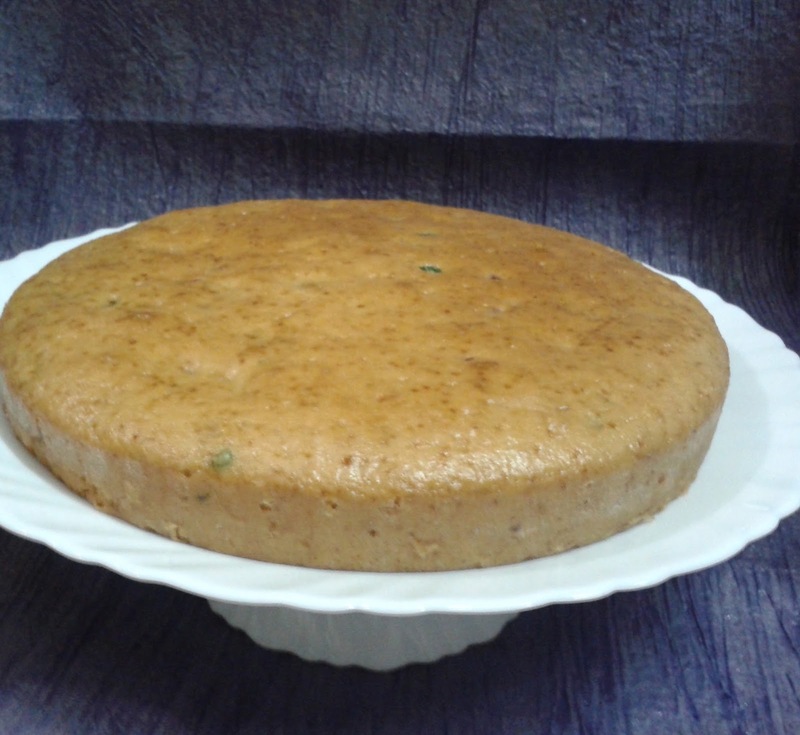 curd,sugar ,oil and vanilla essence, mix well till the sugar is completely dissolved. Now gradually mix dry ingredients with wet ingredients using cut and fold method. If the mixture is dry you can add 1/4 cup of milk to the batter. 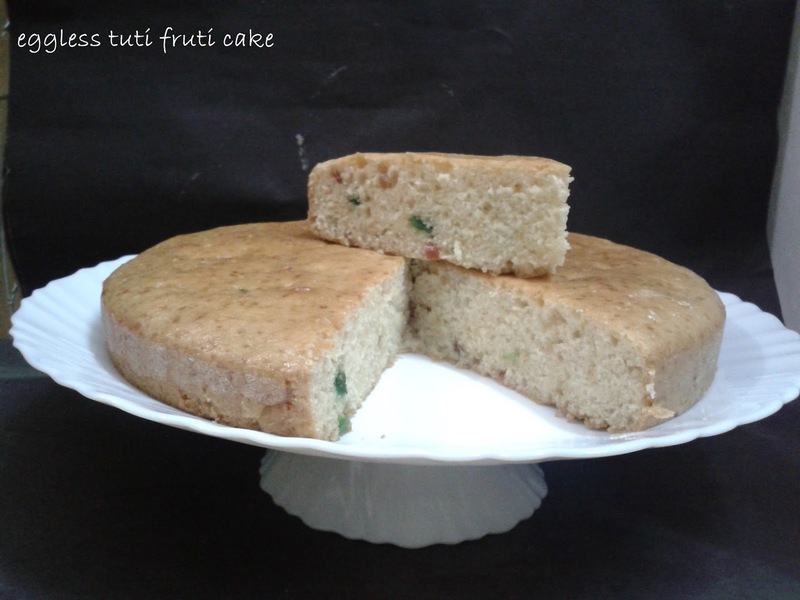 Now Put the mixture in the baking dish and top it with the remaining tuti frutti. Bake in the pre-heated oven for 30 minutes on 180 C.
Check after 30 minutes with a knife if it comes out clean then its o.k. otherwise bake it for 5-10 more minutes as required. Take one ball at a time and spread it evenly on the polythene bag with the help of damp fingers and try to make a thin round chapati. Heat a griddle pan and grease its surface with some oil or ghee. Pick up the polythene bag along with roti with one hand and transfer the roti on the other hand peeling off the polythene and immediately place it on the hot tava or griddle. Turn the side after 1 minute using a spatula grease the upper side with some oil and then again turn the side and grease it as well. Press each side with spatula after turning the side. Top the makki ki roti with butter and serve hot with sarson ka saag,ghee shakker or gur. you can roast it without oil as well. 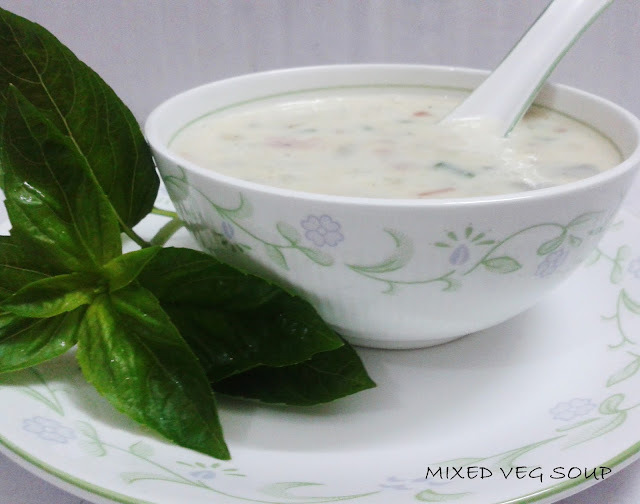 Mix mashed potatoes,cottage cheese,green chili,chopped coriander,bread crumbs,all spices and salt in a bowl and divide the mixture in 6 equal portions. Make small balls and then flatten them and keep cheese cube on each flattened ball and gather the sides of the mixture so that the mixture completely covers the cheese cube. Shape each like a nest. Roughly crumble the sewian in small pieces and keep in a plate. Dip each nest in the cornflour water mixture and then roll them in sewian and fry in hot oil. Peel and wash summer squash , then cut it into desired shape. 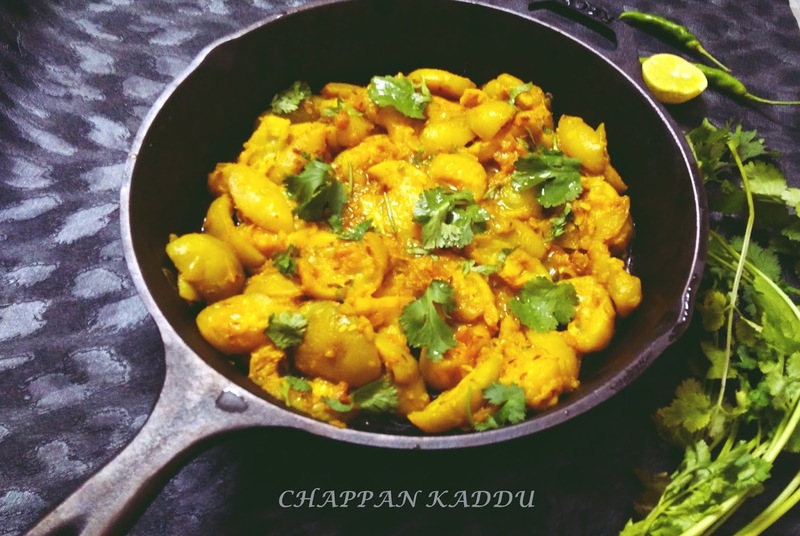 Heat ghee in a kadahi (wok) and add cumin seeds, when they start to crackle add chopped onion and green chilies to it , cook for a while and then add summer squash,salt and turmeric powder to it and mix well. Cook under lid for 2-3 minutes on low flame. Check if any water is required , if needed add 1/4 cup water and cook further for 7-8 minutes stirring occasionally or till it becomes tender (if required add 1-2 tbsp water but don't make it too watery). Add rest of the spices and mix well and cook for 2 more minutes stirring continuously. 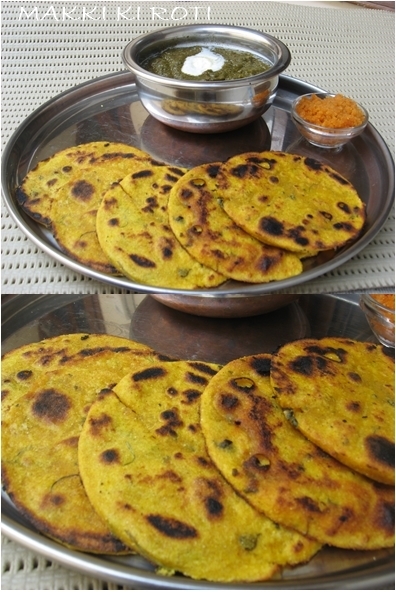 Garnish with chopped coriander and serve hot with daal and chapati. Peel, wash and cut potatoes into fingers.Keep them in cold water for 15 minutes. Drain out excess water and dust potatoes with cornflour,salt to taste and degi mirch and mix well. Heat oil in a wok and deep fry potatoes till crisp and golden brown in color. Drain out on a tissue paper and keep aside. Heat 1 tbsp oil, fry green chilies and garlic. Reduce heat and add salt ,pepper,soya sauce, tomato sauce ,chilly sauce and honey. Add cornflour mixed in water and cook for 2 minutes. Now add fried potato fingers and mix well. Cook for a few seconds till the sauce coats the potatoes. Sprinkle roasted white sesame seeds (roast them on griddle for a minute) and coriander leaves or spring onions and serve hot. Wash and soak kala chana, for at least 4-6 hours. Drain out excess water and boil chana adding salt and 4-5 cups of water in a pressure cooker. Simmer the gas after two whistles and cook on low flame for 30 minutes. Meanwhile heat ghee or oil in a pan add cumin seeds and as they crack, add asafoetida ,green chili,ginger,garlic and stir for few seconds. Add rest of the spices and stir for another minute add a tbsp of water to it to avoid burning of spices and keep the tempering aside. Turn off the gas after 30 minutes and wait until all the pressure releases. Now mash Kala Chana with the help of a hand blender of mixer to thicken the gravy. Now add the tempering and cook it further for 2-3 minutes on low heat. You can always adjust the consistency of the gravy by adding more water. Simmer for a few minutes after adding the water. Stir in lemon juice and chopped coriander leaves, just before serving. Heat oil in a pan and add garlic and onions and stir for 2-3 minutes. Then add choped capsicum, carrot, french beans and cabbage and stir for a while. Add water and let the above mixture come to a boil. Mix cornflour with half cup water and add to the vegetables. saute well. 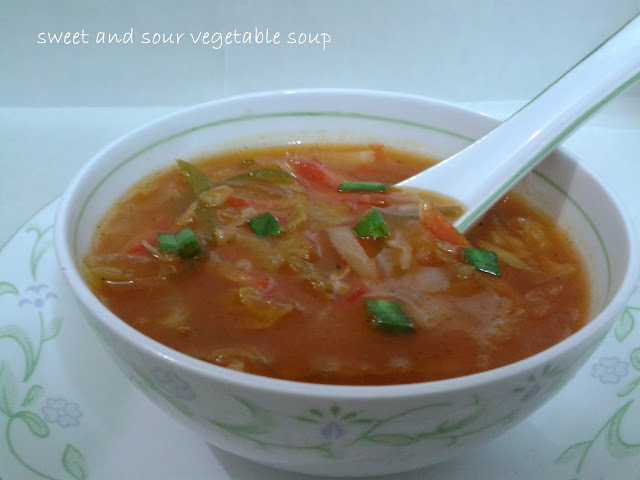 Add soya sauce, tomato ketchup,tomato puree, vinegar,sugar,salt and pepper and let cook the soup for 2-3 minutes on high flame. You can add more vegetables as per taste and availability like mushrooms,baby corn,broccoli etc. Crush ginger and garlic to paste. Heat oil, and add cumin seeds, when the start to crackle add ginger garlic paste, stir a while and pour in water. Boil for 3-5 minutes and season with salt and pepper. Add lemon juice just before serving (optionally, soy sauce and vinegar could be added. 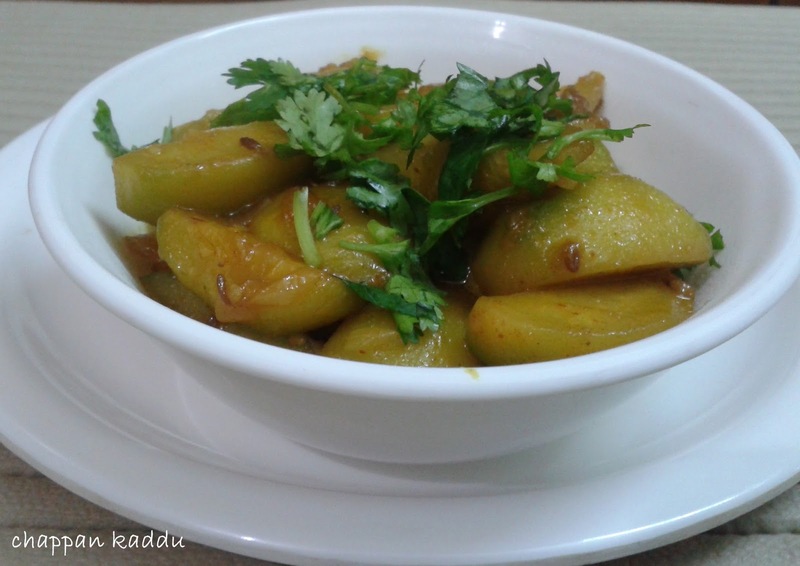 ), garnish with chopped coriander leaves and serve hot. 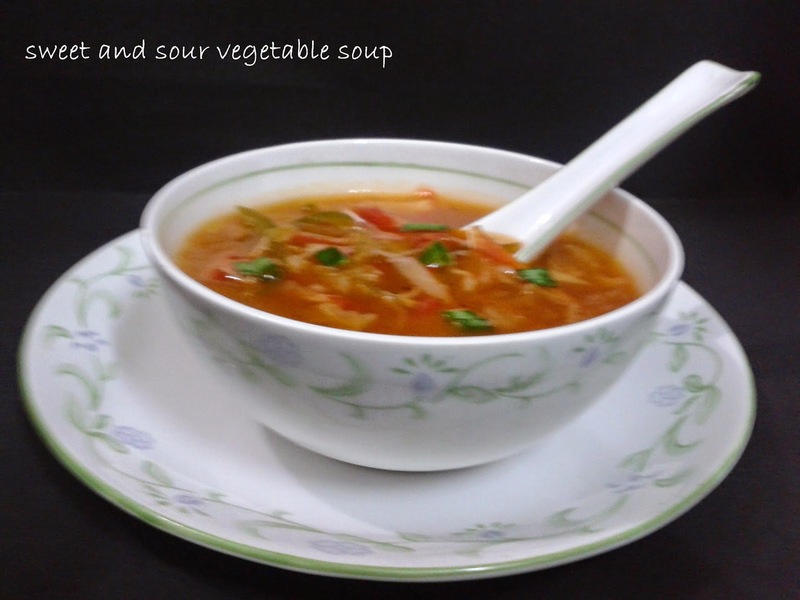 Mixed vegetables like finely chopped (carrots, beans, cabbage, mushrooms) can also be added while boiling the soup. Add all purpose flour and stir for a while, add milk and two cups water stirring continuously till the soup thickens. Add rest of the vegetables,salt and pepper and cook till the vegetables become tender. If you want a thicker soup then add 1 tbsp cornflour dissolved in 1/2 a cup milk and cook for 2- minutes. 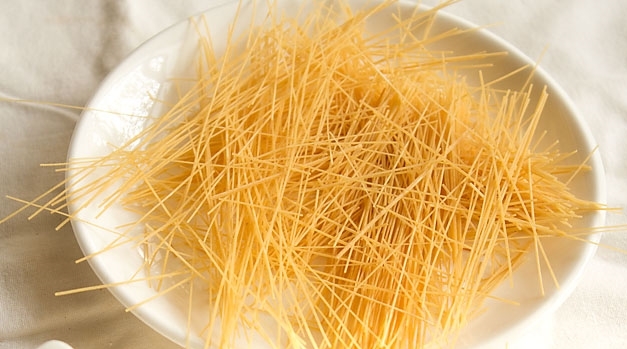 if you want thinner soup then you can add water. You can add more vegetables like peas,corn, baby corn,broccoli etc. as per taste and availability.